Looking for an educational experience the whole family can enjoy together? Our fun, daytime programs, early bird and evening night hikes are sure to fill the bill. These family-oriented programs explore wildlife through animal demonstrations and hikes through the Zoo as well as crafts or games in a manner that is sure to be fun for all ages. Hurray for Mom! From the gentle jaws of an alligator to the comfy pouch of a wallaby, many animals (including humans) have close relationships with their mothers. 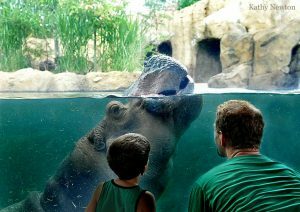 Come and learn about our Zoo moms as we prepare to celebrate all moms during this month's holiday just for them. Family Night Hike: Hey Baby! The Zoo babies are here and they sure are cute! Come and learn some information about them such as their names, birthdays, and what their family lives are like. With some animal visitors in the classroom and an after-hours Zoo hike, we'll learn if there are any more babies on the way and why each birth at the Zoo is cause for celebration! Open to all ages, unless noted otherwise. Children under the age of 18 months are free. When are Family programs available? See schedule for prices. At least one adult must sign up and attend with each family registration. Most occur in the Harold C. Schott Education Center. Confirmation materials will be received once you have registered.